The male has blue upper parts and face; white underparts, undertail coverts, chin, and breast; two white wingbars; and black necklace, vertical streaking on the breast, and eyeline. Black-throated Blue Warbler (Setophaga caerulescens) has a black face and throat, and no white wingbars. In 2011 all of the wood warblers were reclassified resulting in new genus names for almost all of them. 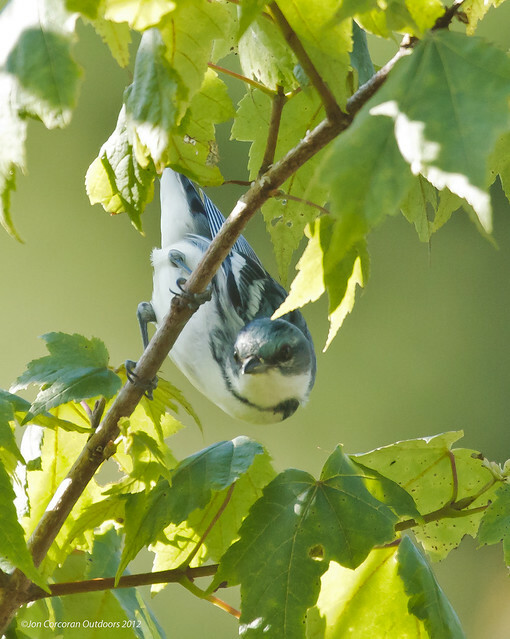 The Cerulean Warbler, formerly classified Dendroica cerulea, is now classified Setophaga cerulea. Cerulean Warbler, Setophaga cerulea, singing. Cerulean Warbler, Setophaga cerulean, singing. 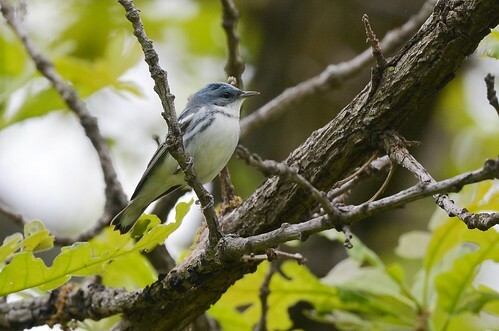 University of Tennessee conducts a study on cerulean warblers, a neotropical songbird that nests in the Cumberland Mountains and winters in South America. Doctoral candidate Than Boves is working to ensure the continued survival of cerulean warblers and the preservation of their environment.